Thank Godzilla it's Friday as it is time for part five of "Godzilla Week 2014". 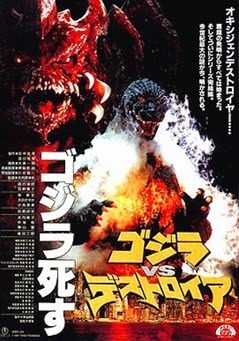 In this installment I will be taking a look at the fifth (and final) Godzilla film that is part of the "Heisei Series" titled "Godzilla Vs. Destoroyah". Nope it isn't about Godzilla fighting giant versions of the band "Kiss"... Although that would've been interesting. This film starts off with a very angry and very different looking Godzilla attacking Japan ruthlessly and aggressively. Turns out the reason why Godzilla looks different and is in a frenzy id due to an off-screen explosion at an mercury plant. 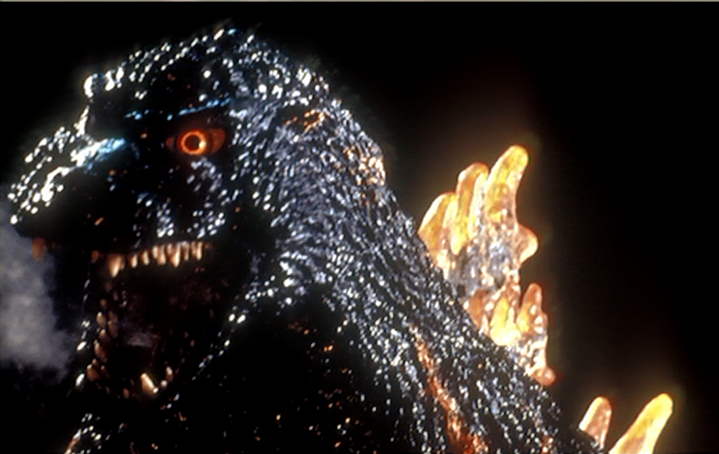 Godzilla has absorbed too much power and is starting to glow red due to his insides heating up greatly and if they don't stop him he'll get so hot that he'll meltdown and burn up the Earth's atmosphere (sounds fun). G-Force's plan to stop Godzilla is to destroy him with a replica of the bomb that killed the original Godzilla all the way back from "Godzilla (1954)". 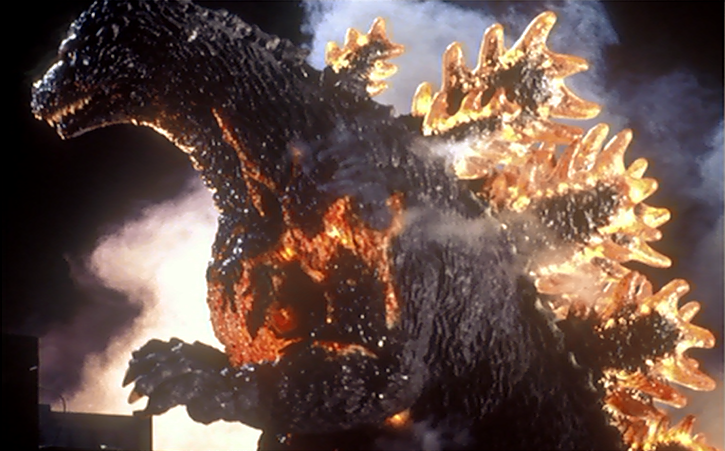 However after some research on the sand around the area where the original bomb was let loose they find that the explosion has mutated another creature (like how Godzilla was mutated from a nuclear bomb) named Destoroyah. Looks like this is the end of the world as we know it. (Click "Read More" to read the whole review). While I did like the story there isn't anything much going on in the film and what you see in the description of the film is pretty much what you get (with the removal of major spoilers that is). This is both a good and bad thing with the good being that it gets straight to the point but the bad is that I'd wish that there was a bit more to the story as it feels a little thin. A reason why I would've liked more in this film is because they could only do so much with it and it really shows as they like to stretch out some scenes as far as they could to fill a movie. Instead of them stretching out the scenes it would've been nice to add some sub-plot to fill in those holes. I was mixed on the characters as I liked the idea of using relatives of characters from the original film although they made a huge chunk of the characters useless. It was nice to see some characters from the original film appear in this one with the same actors. For the characters that weren't useless they were pretty interesting and likable. The monsters in this one I am also mixed on and while both Godzilla and Son of Godzilla looked cool in this one I found the design for Destoroyah to be quite lazy looking as all they did was rip off "Alien (1979)" and "Predator (1987)" and put them into one. Sure that may sound awesome but it didn't work in this case and if you want to see a better looking version of this monster then I recommend checking out "Alien Vs. Predator 2 (2007)" or even "Cloverfield (2008)". 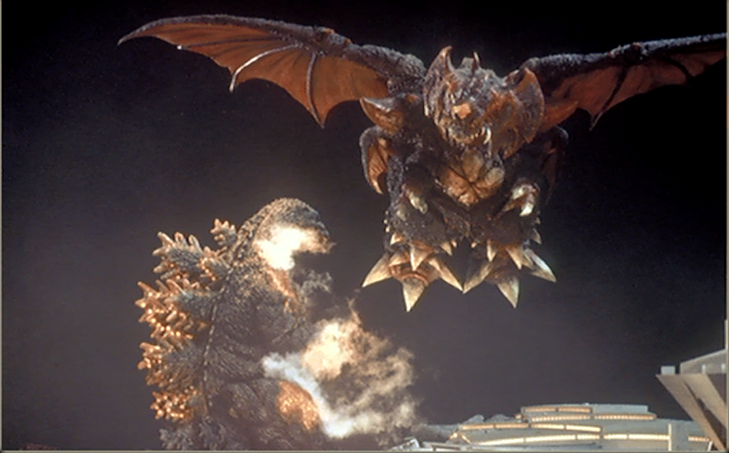 There were some pretty good destruction scenes in this film from both Godzilla and Destoroyah but when they both fought each other nothing much happened with mostly punching for most of it and it wasn't until the end that we started to see some firepower thrown into the battle. Special effects in this film looked really good and it looked like that they really went all out in this one. Not all of the special effects have aged well as there is some use of CGI in this one for some of the vehicles like planes and helicopters. The CG looked especially bad when they use it in scenes where they have the 3D vehicles mixed with the traditional miniatures. The English dub in this one didn't sound bad at all and the voices went well with the characters. There is not a bad amount of special features included on this disc. You do get some stuff that can be found on the other discs like: Movie trailers that aired in cinemas, teaser trailers, and television ads that aired in Japan. I wasn't a fan of them as they revealed far too much of the film. You also get promotional pictures that are in higher quality than the film and would look nice on postcards. I'm really surprised that this disc didn't include the movie posters like the rest of the discs in this box set. 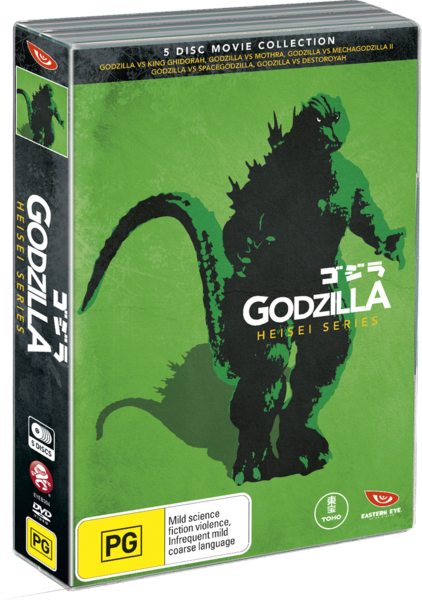 The new type of special features that only appeared on this disc includes: A whole load of concept designs, sketches, and prototype puppet photos of Godzilla, Son of Godzilla, Destoroya, and all of the fancy vehicles. All the pictures were very interesting to look at as you do get some awesome looking designs plus gaining knowledge of what could've been for the costumes of the monsters. Finally you get a real neat trivia section full of some awesome information that is sure to help you out with some of the more obscure questions in movie trivia night like "Who was Godzilla originally going to fight in this film?" (I'm not lying, you'll really find out the answer to that question on this DVD). If this movie was a long one then I wouldn't be recommending this one but this is actually one of the shorter Godzilla films so it is actually tolerable in this case with only some scenes dragging out. This film isn't a "must see" by any means either but it was worth one watch and I can just barely recommend it. I wouldn't blame you though if you didn't like this film though. Good but not great. Well that wraps it up for the "Heisei Series" of Godzilla films but that doesn't mean that "Godzilla Week 2014" is over just yet. We've still got the weekend to go and we've still got some of Godzilla's biggest films to go. So stand by as on tomorrows edition I'll be looking at... Nope I'm not spoiling it. You're going to have to wait a day.